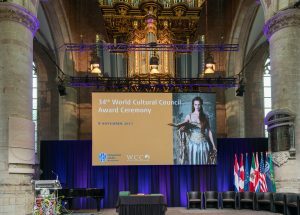 On November 8, 2017, I was presented with the Leonardo da Vinci World Award of Arts which is conferred by the World Cultural Council (WCC). 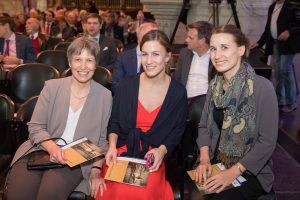 The award ceremony was held at Leiden University in the Netherlands and many dignitaries were in attendance including Sabine Nölke, Canadian Ambassador to the Netherlands. 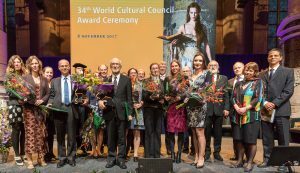 WCC Award Ceremony at Pieterskerk, Leiden University. Prof. Omar M. Yaghi accepting the Albert Einstein World Award of Science from Sir Colin Blakemore. 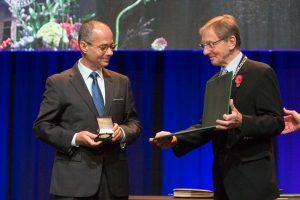 The recipient of the Albert Einstein World Award of Science this year was Omar Yaghi, Professor of Chemistry at the University of California-Berkeley. He was recognized for his original accomplishments, both theoretical and experimental, that have spurred the creation of a new field of chemistry called Reticular Chemistry. In his research, he has developed new materials for application in clean energy, hydrocarbon emission, clean water production, catalysis, and more recently, electronics. Previous winners of the Albert Einstein Award include many Nobel laureates. The Leonardo da Vinci World Award of Arts is not always awarded to a musician. 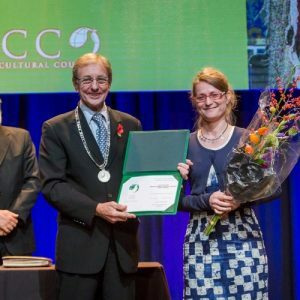 On their website, the WCC states the Leonardo da Vinci Award “is an acknowledgment to those who lift our existence to a higher level by the beauty or inspiration of their creative talent. It is conferred on a renowned artist, sculptor, writer, poet, cinematographer, photographer, architect, musician or other performing artist, whose work constitutes a significant contribution to the artistic legacy of the world.” I was surprised and pleased to see that visual artist Robert Rauschenberg was the 1995 recipient of the Leonardo da Vinci Award. The award ceremony was held in the famous Pieterskerk at Leiden University, the oldest university in the Netherlands. 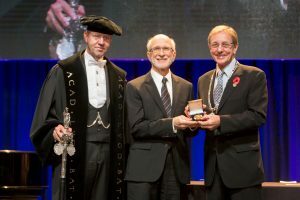 Presenting the awards were Sir Colin Blakemore, President of the WCC, Rector Magnificus Carel Stolker of Leiden University, and Professor Mark Rutgers, Dean of the Faculty of Humanities at Leiden University. As part of the award I was presented with a diploma and a commemorative medal featuring the likeness of Leonardo da Vinci. 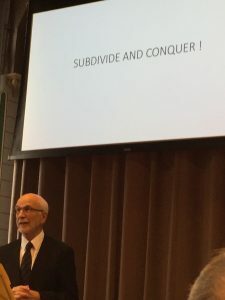 Subdivide and Conquer lecture topic. 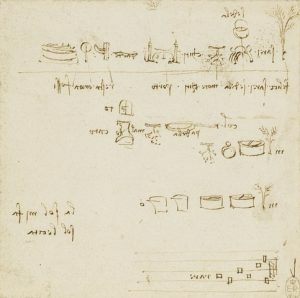 Leonardo’s sketches of percussion instruments; Royal Collection Trust/© Her Majesty Queen Elizabeth II 2017. My acceptance speech at the WCC award ceremony. 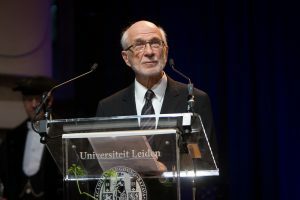 My whole experience in Leiden was made particularly special because my wife, Bonnie Sheckter, and my two daughters, Laura and Carla, were there with me to share in the celebration. WCC award winners included Special Recognition Diplomas to nine women from Leiden University who excel in various areas of research. Of particular interest to me was the work of Victoria Nyst, who studies sign languages used by deaf communities. Victoria Nyst accepting her Special Recognition diploma from Sir Colin Blakemore. Contrary to what many people think, there is no such thing as a universal sign language. Ms. Nyst’s main focus is on deaf communities in Ghana and other African countries, and she told me she is currently learning Ewe in order to help in that Ghanaian community.